I was on pasta lane last night, I think thats the DKI Travel Services Pvt. Ltd area. Acutually this is what I saw last night and thats why pasta rang a bell ..
NAME PRODUCTS/ SERVICES ADDRESS TEL NO. Actually, DKI is down by the Fatima Manzil area. I think there's another LPG gas store somewhere in the Colaba area. I like your GE picture though with the trees. From the new vidcap, looks like the taxi drops them off by the Maharashtra "Quickie" Mart on 3rd Pasta Lane. No need to look for the other LPG place, as they are very near Colaba Gas Service. Amazing how you read the name from that "crappy" vidcap. Since I know it's Ron & Christina who get eliminated I bet the Speed Bump gets completed during the wait time after landing. Or it could happen amid tasks and R&C have some big problem. May I ask exactly how do you know that Ron & Christina are going to be eliminated? I mean, I don't know what information you have that would make you figure that out -- unless it's the Taiwan spoiler info. eta: I still see Timber!! all the same anyway. Don't make me get my stick! puddin I believe you are missing something in your post. With a nail-biting race to the mat and Chateau's prediction of doom for Ron & Christina, is it the hernia that rears its ugly head and finally Phileminates the team? 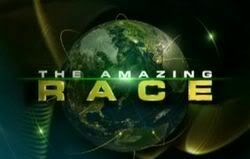 but the nail biting race could be a race for 1st or 2nd place -- we all know that the people at CBS can be tricksters. I think you are right about the race not being for last place. Just providing an alternative. Also, CBS keeps mentioning Ron's hernia, so it has to come into play sometime. Yeah, like next week when someone hopes he doesn't croak. Maybe the croaking think is actually about frogs! This goes down as the biggest bungling by one person in one leg in history. First Kynt decides to U-Turn a team that was nowhere in sight instead of a team that they just saw. Then he forgot the cardinal rule of the Roadblock: READING YOUR DAMN CLUE. Gah. Again I knew it was a Goths and I didn't take Chateau's post as a spoiler, more speculation on his part.